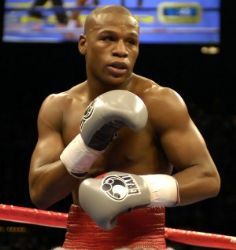 Floyd Mayweather has refused to be drawn over the Manny Pacquiao saga, insisting he is focused only on Shane Mosley. 'Pretty Boy' finally signed a contract to face his fellow American this week, with the bout to take place at the MGM Grand in Las Vegas on May 1. The deal came about after a money-spinning showdown with Pacquiao collapsed due to disagreements between the two camps over drug testing. Speaking to Sky Sports News, Mayweather insisted he was no longer thinking about 'Pac-Man', who will face Joshua Clottey on March 13 in Dallas. "I'm just focused on nobody but Shane at this particular time. My main focus is Shane Mosley," he replied when asked about the Filipino. Instead of Pacquiao it is Mosley next for Mayweather, who is currently in Florida before attending Super Bowl XLIV on Sunday. But while he may be getting into the party spirit this weekend, the 32-year-old promises he will be in "top condition" for what he expects to be a great fight. "I'm very excited," he said about the Mosley fight. "I'm taking it one day at a time, hanging out with my team, going over the gameplan and preparing to get into the camp. "I can't say what type of shape Shane is going to be in, but of course I'm going to come in top condition. "He looks pretty good, (he's) conditioned really well in all his fights. It should be a great fight come May 1." If a Pacquiao fight doesn't materialise afterwards, another possibility for the man from Michigan could be a second clash with Ricky Hatton, who has confirmed his return to boxing following a lengthy break out of the ring. However Mayweather - who won the first meeting between the two back in 2007 - believes the Hitman would be better served hanging up his gloves. "Ricky Hatton is a tough guy but he's been in a lot of tough fights, so I think now is the time for him to hang it up," he said of the Briton. "But the fans in the UK support him. He has a very, very strong following and he's a hell of a fighter. "He's been in a tough fight with me...he's been in a lot of tough fights, a lot of tough wars. Boxing is about wear and tear on the body."